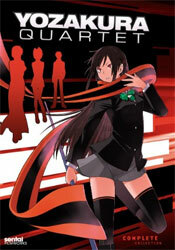 The Anime Archivist: Video Backlog: "Yozakura Quartet"
Somewhere outside Tokyo, a town called Sakurashin exists. It is a town where demons and humans coexist. The town is protected by a barrier created by seven humongous pillars which are “spiritual sakura (cherry blossom trees)”. These seven pillars exist in both the human world and the demon world and connects both to each other as well as shielding the town from uncontrollable demons. The town itself doesn’t have a council per se. Instead it is run by the Hiizumi Life Counselling Office. This is a centre run by four teenagers; Akina Hiizumi, an 18 year old human male who the director of the centre who can “tune” demons back to their own world, Hime Yarizakura, a 16 year old girl who is mayor and is apparently the human form of an ancient dragon, Ao Nanami, a demon wolf girl with telepathic and precognitive abilities, and Kotoha Isone, a half human, half demon girl who’s ability is to materialise objects using only words. A number of demons and humans help the four members, most notably Kyosuke Kishi, an 18 year old “oni” (ogre) demon, who is probably the most rational and dependable person in the group. After a rash of incidents where girls are threatened by a man wielding gun are solved, everything seems peaceful in the town again. However a demon named Enjin Hiizumi arrives on the scene and is hell bent on destroying the barrier that protects Sakurashin and its inhabitants. To complicate things further Enjin has possessed the body of Gin, Ao’s missing brother and Akina and Hime’s friend during high school. Of course eradicating this threat who has close links to three of the four members Hiizumi Life Counselling Office proves to be a seemingly impossible task. Soon Enjin has weakened the barrier enough to threaten not only the existence of the town, but the entire planet as well. From the very first batch of Sentai releases, the company has shown they like to snap up the other shows that other companies ignore. And it’s (mostly) not the crap leftovers either. There are truly some gems and a lot of lesser shows that aren’t exactly gems, but they’re still very good. This show falls in the latter category. I think the whole demon world/human world colliding together thing and both parties have to get along type story has been done to death (see “Hyper Police” and “Combustible Campus Guardress”, the latter of which it most resembles), however the stories presented here in this show are quite refreshing. Perhaps this have more to do with the presentation and style of the show than the actual storylines. The designs and feel of the show seemed very familiar to me when I first watched it. It felt very similar to “Durarara!!”. I was kind of unsurprised to discover that Suzuhito Yasuda who did the character designs for “Durarara!!”. “Yozakura Quartet” is Yasuda’s first manga series. The key to this show’s success is probably the fact at the core of the show it’s a slice of life type story with some nice drama and action/fight sequences laid over the top. The demon powers in particular are really quite well released. Kotoha Isone’s power of making objects, mostly various kinds of firearms, was truly inspired I thought. I think what lets down the show is probably some of the actions of a couple of characters, in particular Akina Hiizumi. It was really hard to feel any sympathy for himself whatsoever. In the show it is explained that both Akina and Hime have essentially inherited their roles. Between the two, Akina in has more difficulty as he sort of sees his role in “tuning” as a curse as such. One demon in the show calls him a murderer as they view tuning as a death sentence. As a result, Akina is a little lazy when it comes to his duties. In the eyes of the audience most would see him as a slacker. His lax attitude clashes with the other members Hiizumi Life Counselling Office towards the end of the series as the town is falling apart. While there is some sort of attempt in the end to redeem his character, it’s not really well done any just about everything else going on overwhelms any effort to do so. As a result I could neither sympathise or empathise at all with Akina. There’s also a number of rather interesting secondary character such as the ”land gods” like Yuhi Shinatsuhiko, who takes the form of a young boy despite being over 250 years old. However I really felt their roles weren’t thoroughly defined or explored. A couple more episodes could have been added to the series to flesh things out a bit more. In the end I quite liked this series. It most certainly isn’t a classic, but it’s a really solid piece of entertainment and you can’t ask for much than that. 7 out of 10.